Ah, Fall. The season where the leaves change, cooler temperatures welcome me in the morning and I anticipate the falling of snow. Oh, wait, I'm in Florida where none of these things happen. 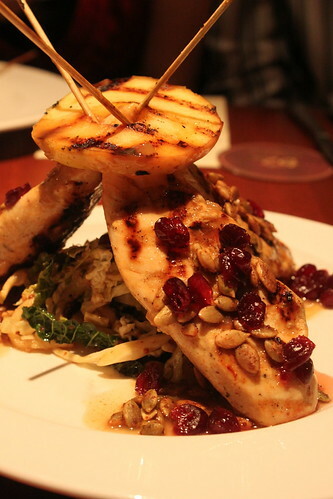 Luckily, I believe we may have found something better in Seasons 52, especially when the feel of Fall is in their new menu. 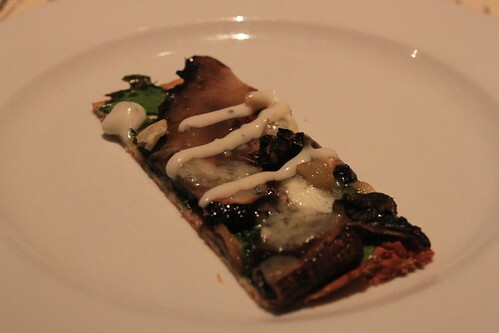 Earlier this week I was invited to taste some of the items on the new Autumn menu that was launched last week. 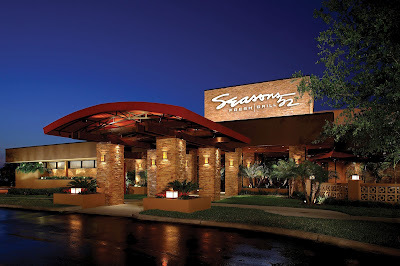 Seasons 52 always puts on a great event and this time was no exception. With a handful of us in attendance in one of the private party rooms, it was cozy like the season should feel and we experienced fantastic service from the staff. 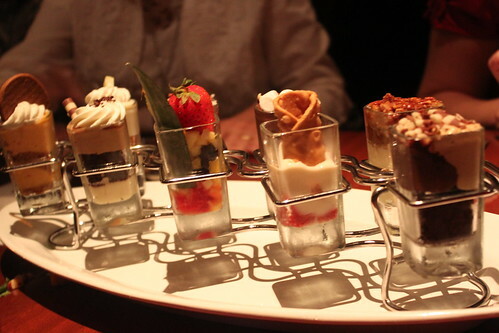 In case you are unfamiliar with the Seasons 52 concept, the restaurant has a pretty great one. They take the freshest ingredients of the season, each season, and craft a menu that truly shows the tastes of that time of the year. There are a few core menu offerings that you'll find year-round, but Seasons 52 really works to revamp their menu each Spring, Summer, Autumn and Winter to bring you something new every time. One of the best parts? 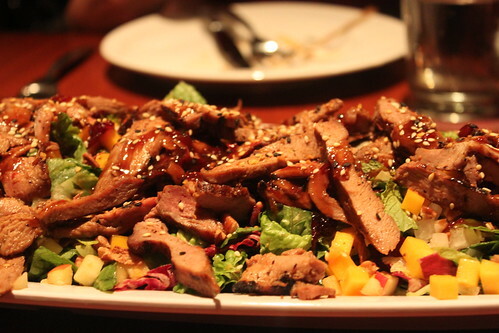 Every single menu item sits at 475 calories or less. So, not only do you get a flavorful, unique, and seasonally-inspired meal any time, but you can eat guilt-free without really realizing it in the taste of the dish. 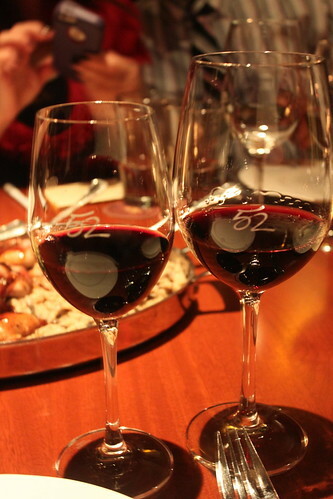 Each dish at Seasons 52 is created by award-winning Chef Clifford Pleau and at the tasting, each course was paired with a wine chosen from the "Drink Them Before They're Famous" wine selection, selected by Master Sommelier, George Miliotes. We were treated to a live video stream of the two of them explaining what we would be sampling throughout the evening. First up was the Vista Hills Orange Pinot Gris paired with Portobello Mushroom Flatbread and Double Hummus & Sea Salt Lavosh. 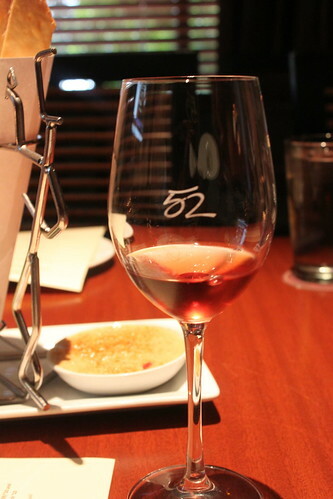 The "Orange" in the wine comes about because this wine is a white made as if it were a red wine. With both white and red wine characteristics, along with the notes of raspberry, apple and citrus fruit, this particular selection pairs well with everything. 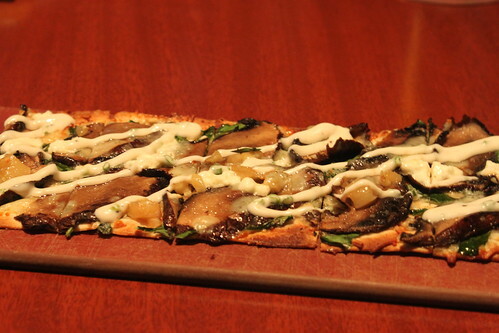 The flatbread is made with mushrooms, spinach, garlic, a blend of four cheeses (mozzarella, parmesan, goat cheese and gorgonzola) and drizzled with...get ready...Truffle sour cream. In my mind, you can pair truffle oil with just about anything and it's love. Truffle Oil is earthy and warm, yet sweet and savory, and really works to highlight individual flavors in a dish. 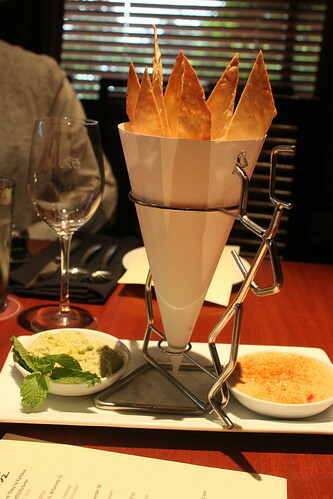 The Sea Salt Lavosh was paired with two different hummus treats. I couldn't decide which I liked more so I alternated between bites, sometimes even mixing, and it was awesome. 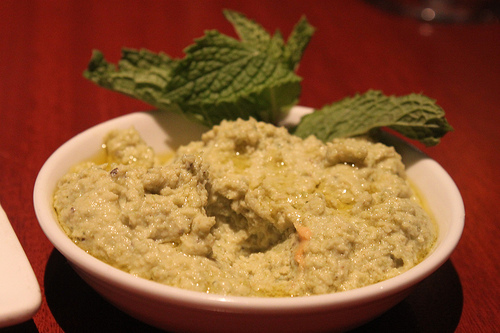 The Edamame hummus was made with mint, garlic and olive oil. 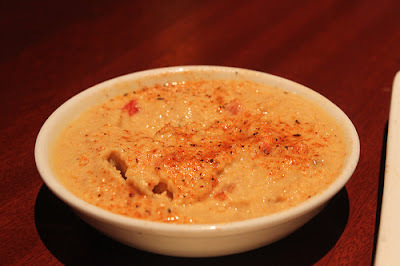 The Red Pepper hummus was made with garlic, fire-roasted red peppers and chili powder. 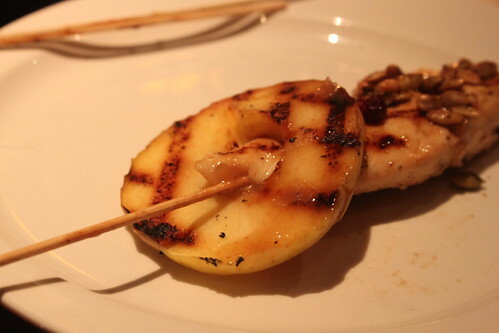 Next, we were treated to Cider-Glazed Grilled Chicken Skewers paired with Farrier Andiron Semillon wine. These chicken skewers would be great to order for a private party so everyone can just pick their skewer without having to deal with large spoons and scooping anything. It's an easy presentation! If you'd like to order an individual portion as your meal, this would be the presentation you would get. 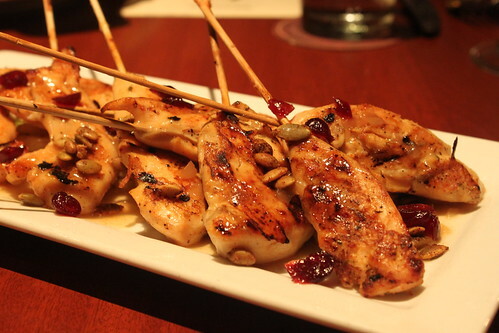 The chicken skewers come with a Fuji apple slaw, toasted pumpkin seeds and dried cranberries- all flavors that go perfectly together. The chicken is coated with both the cider and mustard sauce for a unique taste. Of course, the individual portion is really eye-catching with the pierced apple at the top. I couldn't keep from trying it out. 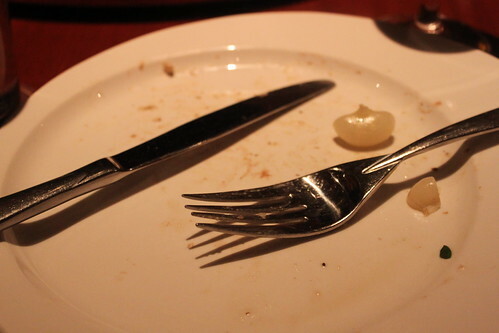 It received the food blogger stamp of approval. Next up we had the Avanthia Godello, Valdeorras with Maple Leaf Farms Sesame Duck Salad. With chopped greens, apples, mint, cranberries, butternut squash, jicama and toasted pecans, there was a lot going on in this salad, but it presented beautifully. This was my first time trying duck and quail (which you'll see later) and I wasn't completely thrown off like I expected myself to be when I first saw this course on the menu at the beginning of the evening. The flavors were all there and the dressing used really captured all of the components of the dish. 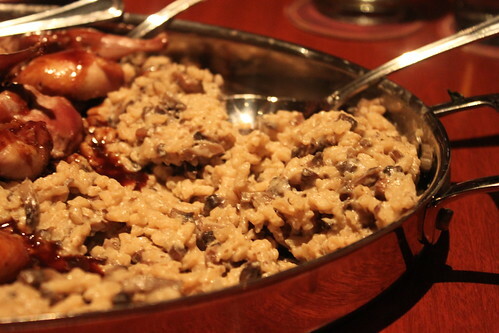 The duck was flavored well and added even more depth to a dish that already had a lot of depth. 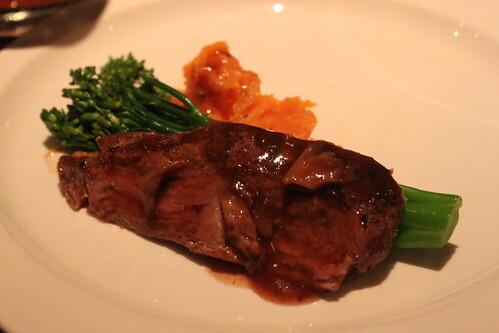 Now, when I went to the Summer menu tasting back in June, we had one of the most delicious steaks of my life. I'm a girl who likes her red meat done very, very well. In fact, at Japanese steakhouses I'm jokingly told to "come back the next day so we can cook it all night" and "oh, so you want beef jerky?". I normally won't eat a steak that has any pink in the middle whatsoever and so my experience with beef probably isn't as great as anyone else's. 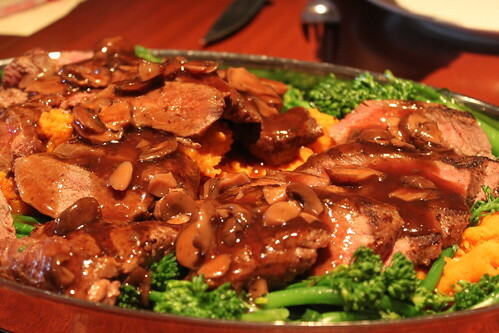 However, the Piedmontese Steak at Seasons 52 is my exception. It's a huge, probably incomprehensible, feat for me, but I will eat this steak medium well. It's true! It's so flavorful! In the summer it was paired with asparagus and fingerling potatoes, but for Autumn we have broccoli and sweet potatoes. Paired with the steak was the Tilia Bonarda, Mendoza. This wine, from Argentina, is made from grapes grown at a 2,000-5,000 elevation in a long and cool growth process for maximum flavor. This next course had a side that I would probably jump through flaming hoops of danger to eat. I guess fungi is my friend as I'm pretty much obsessed with mushrooms. 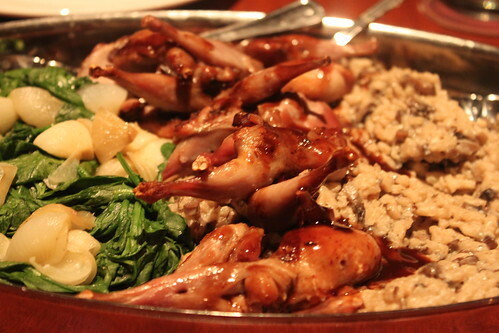 We had Manchester Farms All-Natural Grilled Quail with MUSHROOM RISOTTO and spinach with cipollini onions. 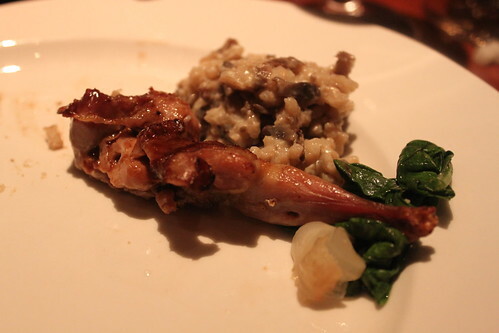 Again, I had never tried quail before and it was a little more gamey than I am used to, but the flavor was there and I'd go back for more. This dish was paired with two different wines: the Michael David Petite Petit, Petite Sirah and Flenelly Cabernet Sauvignon, Stellenbosch. These old world wines were complex and earthy and paired very well with the Quail and risotto. I vote that the Master Sommelier knows what he's talking about. Lastly, and the part that everyone gets the most excited about, we had our choice from the Mini Indulgences. Choices include: Key Lime Pie, Mocha Macchiato, Chocolate Peanut Butter Mousse, Pecan Pie with Vanilla Mousse, Belgian Chocolate Rocky Road, Raspberry Chocolate Chip Cannoli (my personal favorite), Market Fresh Fruit and the newest one for Autumn, Pumpkin Pie with Ginger Snap Crust. 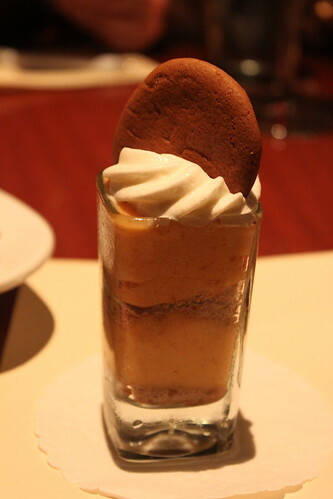 In this mini, there are two layers of everything- mousse and crust- so you get the full taste in each bite! Thank you once again to Seasons 52 for truly making our tasting a great experience to share!